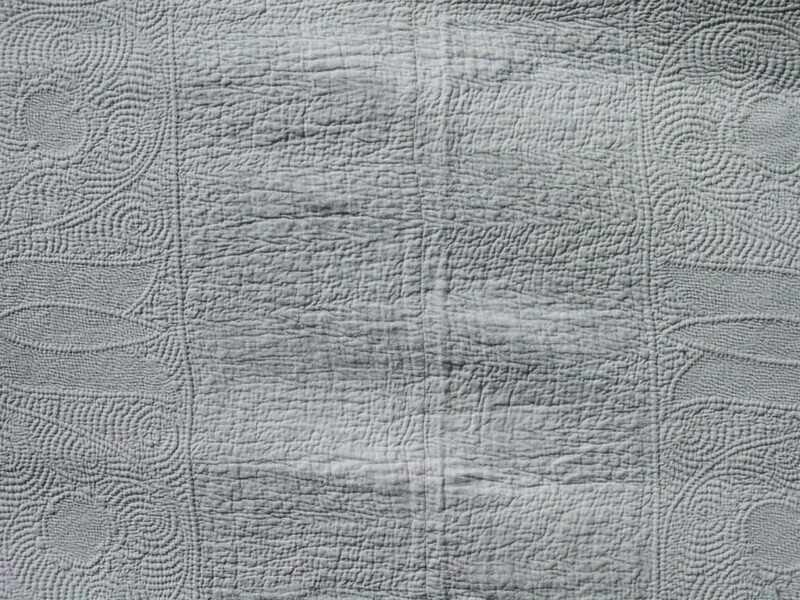 This exquisite example of corded quilting is one of the highlights of my collection – partly because of the unusual layout, and the puzzle this presents. 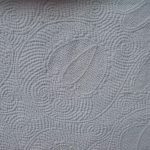 In the eighteenth century, corded quilting was a very popular technique, but is rarely done these days, due to its time consuming demands. 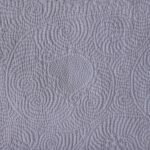 Corded quilting starts with two layers of linen or cotton fabric; the backing fabric being of a slightly looser weave than the front. 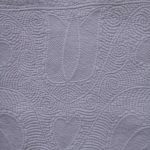 The desired motif is outlined with a double row of fine running stitches, and a soft cotton cord is inserted through this channel from the back. 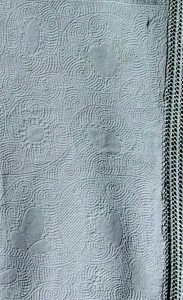 The motifs are filled with rows of similar cording if a raised area is desired, or simply with parallel rows of running stitches through the two fabrics to form a more flattened region giving a contrasting texture. 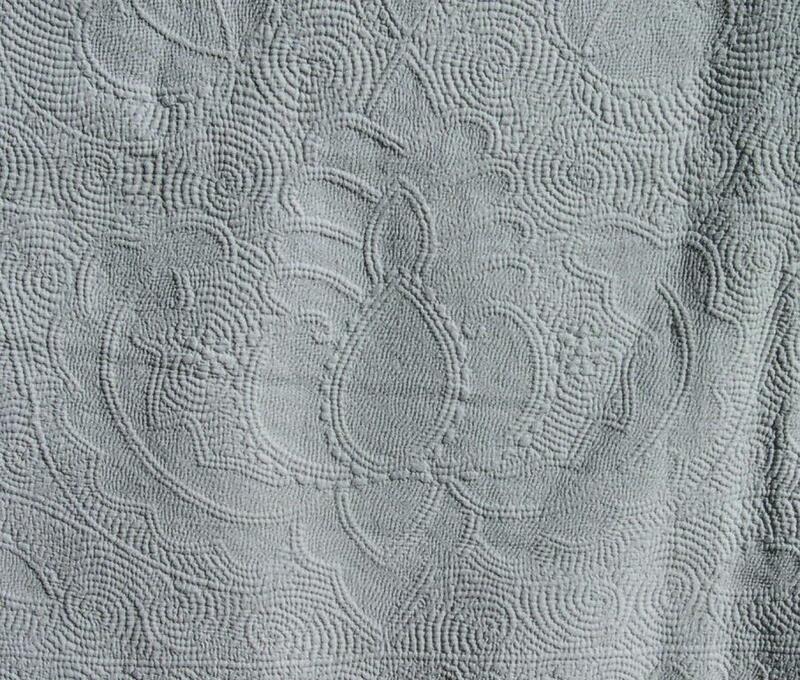 Although not present on this quilt, the cording could be combined with embroidery stitches such as French knots or pulled work, or with stuffed work (trapunto), and the technique eventually evolved into the “boutis” style still known in France today. 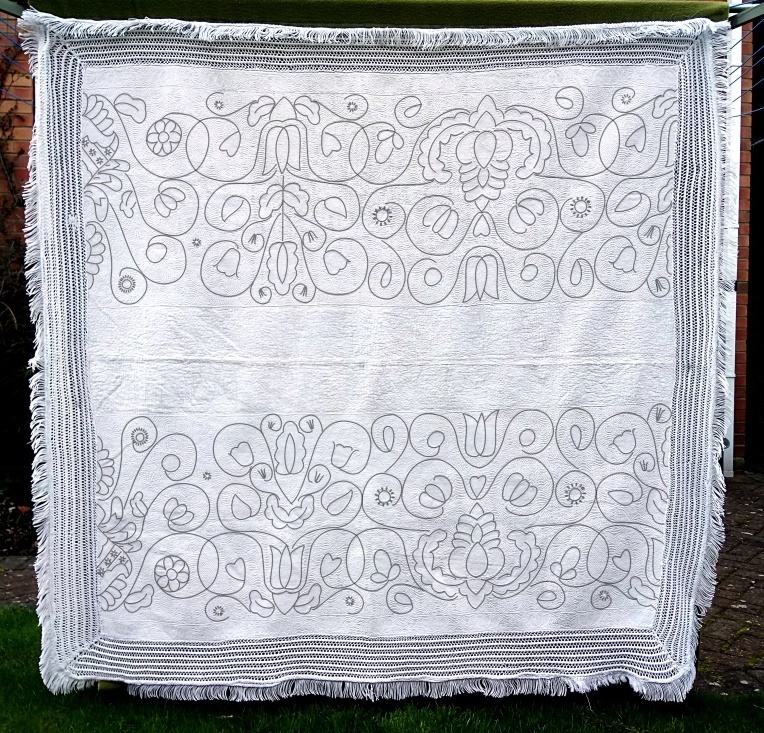 The “quilt” is now in the form of a tablecover with a deep fringe which was undoubtedly added later. White on white is notoriously difficult to photograph – so close-ups, on which the contrast has been heightened are used to show the patterns more clearly (note that this is the reason for the slight blue/grey colour distortion to many of the photos). 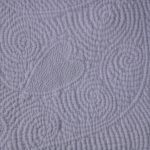 Closer study reveals an area of the design down the centre of the quilt which puzzled me, as the texture is different to the detailed patterns on the outer sections. 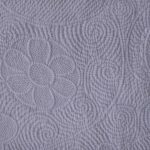 While there are 20” (51cm) wide strips of beautiful corded quilting down both sides, the design changes (without any seams) into a 9.5” (24cm) wide central area which has no cording, and consists of only two layers, stitched together with a simple repeated zigzag pattern. The two halves are joined with a seam down the centre. 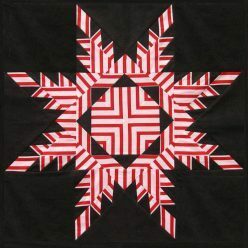 A computer-generated overlay added to the photograph reveals the layout of the motifs, and suggests that the quilt is not in its original format. 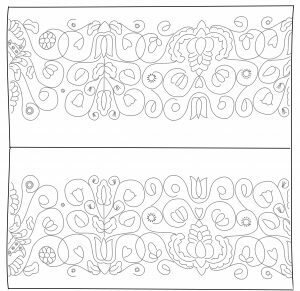 One side is a mirror image of the other, with each side having two complete motifs, and a half motif at either end. There are two large “double-decker” complete designs. The other of which has a large pineapple motif topped with a tulip. Each of these is flanked with large scrolls with a variety of smaller motifs at their centres; apples, hearts, acorns and paisley pears. 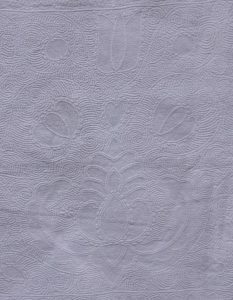 At one end of the quilt, the “tulip and oak leaf motif” can be found again – sliced vertically in half, with the mirror image matching half being found opposite, across the flatter simple zigzag section. At the other end, a new elaborate motif can be found – again sliced in half and mirrored across the centre. 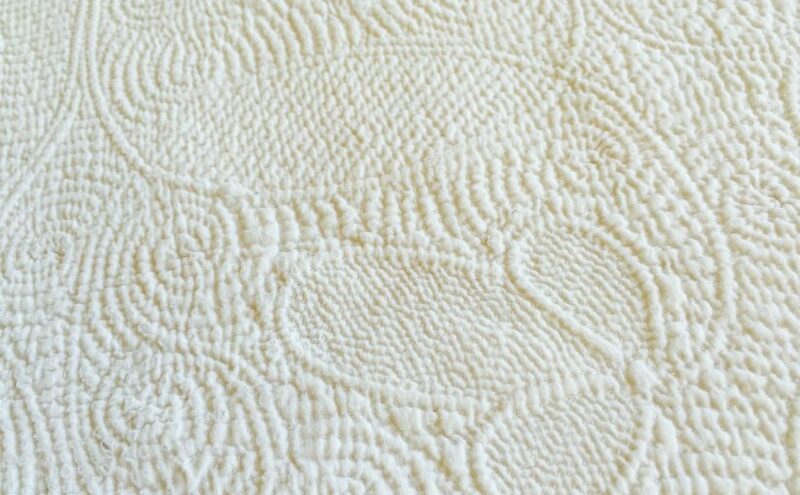 Why would someone make a quilt with this design? Although I am not an expert in this field, after a lot of thinking and reading, I think that I have worked it out – and that in fact this is an example of recycling of an earlier garment – a petticoat made originally in the mid-eighteenth century. The petticoat would have had a deep band of decoration around the bottom, with a simpler area towards the top, which would generally remain unseen, with this less bulky area being pleated onto a tape and tied around the waist. 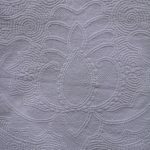 The largest, most elaborate motif would be placed at the centre front, with a symmetrical distribution of other motifs to either side round to the back. 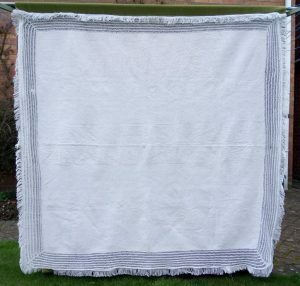 To be remodelled into a flat quilt, imagine the petticoat being slit down the centre front and centre back. 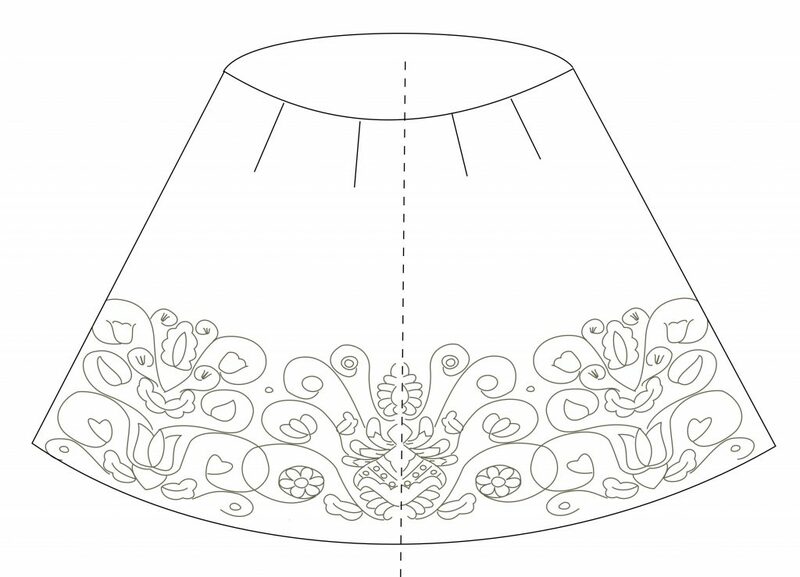 Once the pleated top was unpicked from the waist tape, the two sections could be spread out and stitched together along what was originally the top of the petticoat. 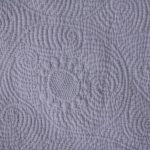 A number of recycled garments or quilts made with corded quilting have been identified in other collections. As the original items would have been luxury purchases, recycling into household items where their decorative qualities could still be appreciated must have been common practice. 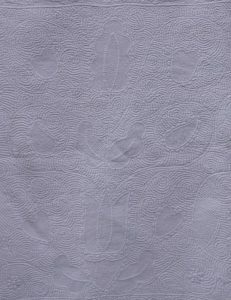 Other items made with corded quilting from the Quilters Guild Collection are also shown in the same issue. 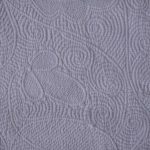 In chapter 8 of her seminal book Quilting, written in 1972, Averil Colby discusses the popularity of corded quilting in this period, and comments on the number of cord-quilted items such as small quilts and clothing which have clearly been made from larger items. 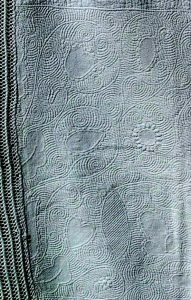 They have a bedcover (IQSC Object Number: 2005.018.0006) with very similar motifs and stitching style which they date to 1710-1740. 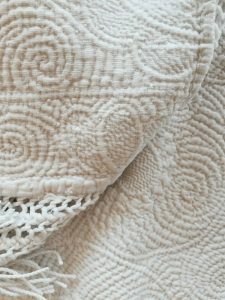 The Victoria and Albert Museum in London has a number of beautiful items made with corded quilting, but unfortunately many do not yet have images on the website. 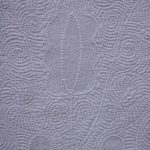 If you are interested in meeting others interested in studying patchwork and quilting more deeply, whether historical or contemporary, why not consider joining the British Quilt Study Group, which is one of the specialist Groups of the Quilters’ Guild, the The American Quilt Study Group or the Australian Quilt Study Groups?